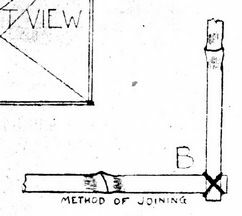 This plan for a rubber band powered Wright Flyer first appeared in the January 1911 edition of Fly magazine. 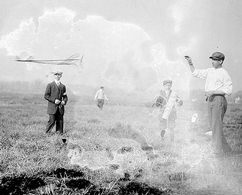 eroplane models, like the larger machines, have become very popular in the last few years, and the demand for comprehensive, non-technical plans for building these small "aeros" has been steadily on the increase. 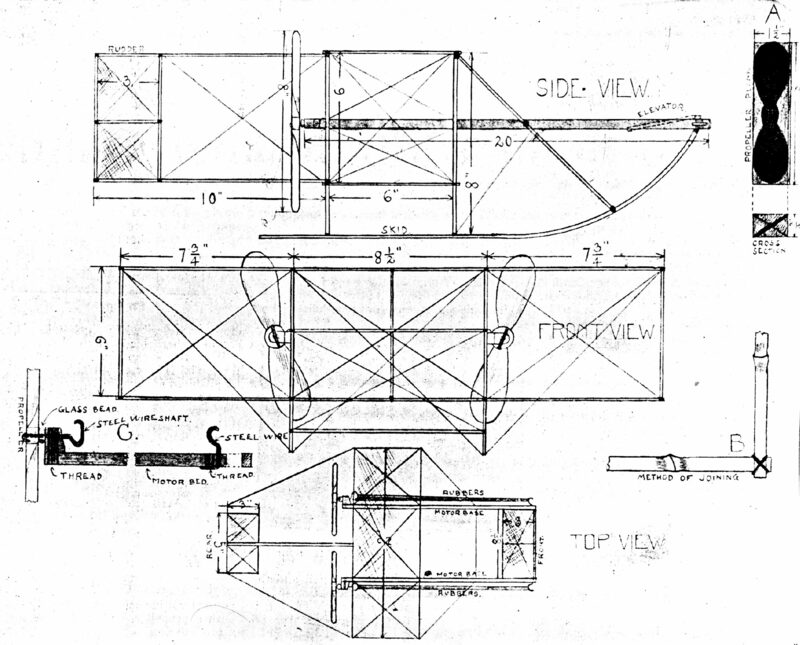 The following paragraphs contain complete directions for the construction of a model biplane that has been made to resemble the large Wright machine as far as possible. Of course, certain modifications have to be made to suit the requirements of a model. 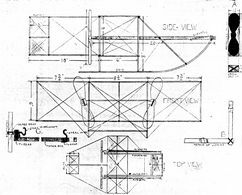 The main planes [wings] of this flyer measure 2 feet by 6 inches, and the frames are made of strip bamboo 1/8 inch thick by 3/16 inch wide1. 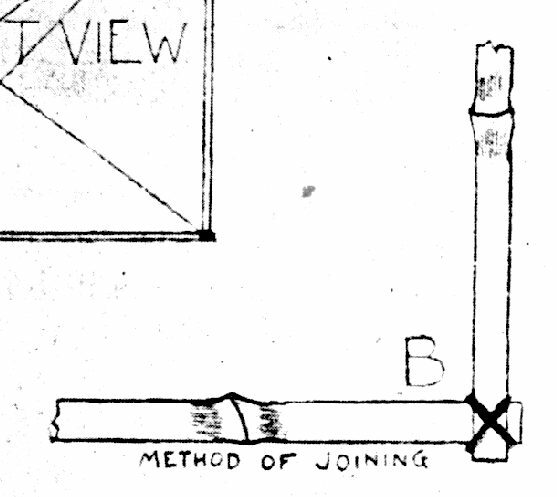 The joints are tightly wrapped with heavy white basting cotton2 and coated with glue, as illustrated in drawing "B." There are eight vertical struts connecting the main planes; four central struts made of 1/8-inch dowel, used to support the motor bases, and four bamboo struts, one for each corner, at the end of the planes. The four motor-bed struts extend 2 inches down below, the lower plane, providing attachment for the bamboo skids. 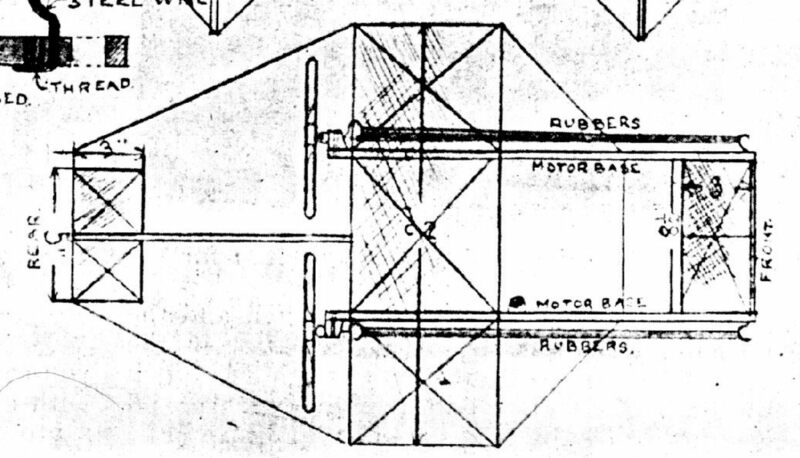 The front plane, or "elevator," is attached directly to the forward ends of the two motor bases. This control should be made adjustable, to obtain the proper flying angle, by experimenting. The rudder and fixed stabilizer are made of 1/8-inch bamboo, and need not be made adjustable. A good grade of lightweight muslin3 makes an excellent covering for the planes. The fabric may either be glued or sewn to the frame. The motive power for running this flyer is derived from two rubber-band motors, driving two 8-inch propellers independently in opposite directions, to avoid gyroscopic action. This necessitates the turns of the propellers being counted, so as to make sure that both propellers make the same number of revolutions. This model has wonderful lateral stability, on account of the absence of propeller torque, which tends to tilt the plane. The motor bases are 1/4- x 3/8-inch cross section and are 20 inches in length. Yellow pine or spruce will do nicely for these. In making the propellers4, select a piece of spruce or white pine 8 x 1-1/2 inches and 3/4 inch in thickness. 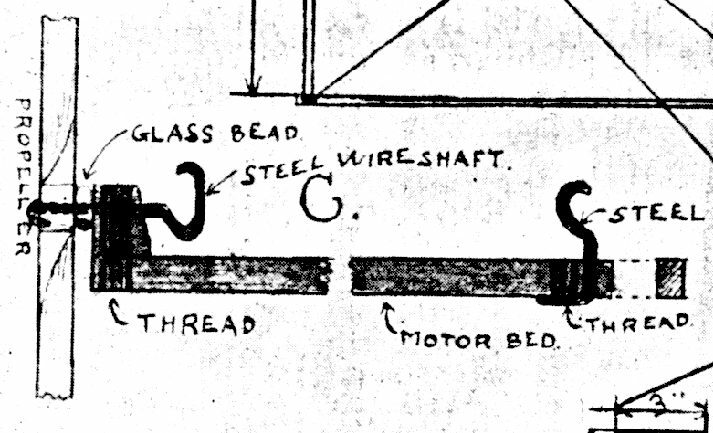 On the broad face of the wood draw the outline of your propeller, and on each end draw a line diagonally from one corner to the other, as shown in drawing "A." This will give the proper pitch to the blades. Be sure to make the propellers opposite in pitch, so that they will drive ahead, turning in different directions. A piece of steel wire5 should be used for a propeller shaft. Bend a hook, shaped like the one at C, on one end, and pass the other end through a hole drilled to accommodate it in the bearing block. Then insert a glass bead6 and a metal washer of some sort, preferably copper or brass, and put on the propeller, allowing about 1/2 inch of the shaft to extend beyond the hub. Bend this end around in a half-circle, and drill a small hole in the hub to accommodate it and drive the end in, thus locking the shaft to the propeller. To provide attachment for the rubber bands at the other end of the motor base, make another hook and drive the free end through a hole drilled in the wood, and bend about 1/2 inch of it over against the stick. To make it more secure, wrap the end to the stick with cotton. Proper rubber bands can be obtained from any model supply house. No. 12 music wire7 is about the best for trussing this model although a heavy grade of shoe thread will do. Now, suppose you have finished your machine and are taking it to an open lot for the first tryout: First, wind each propeller about 150 times, counting carefully, other-wise one propeller will turn faster than the other, tending to slew the model around when in flight. When you have finished winding the propellers, hold the machine by the blades and shove it gently forward. If the elevator is properly adjusted, the machine will rise gradually and sail for a distance of about 100 feet, and land easily on the skids. 1. Bamboo -- Although not as easy to find as it once was, you can still find it at hobby and craft stores. Most barbecue skewers and chopsticks sold in grocery stores are made from bamboo. You can also substitute balsa wood for bamboo. 2. Cotton thread -- Many modelers today prefer silk thread. Heavy-duty quilting thread also works well. 3. Muslin -- The author is not referring to what we think of as muslin, but a much lighter cloth that was used at the turn of the century for ladies underwear. Today, you could substitute modeler's tissue paper or Silkspan. 4. Propellers -- The prop shown is this plan is nowhere near as effective as it could be. 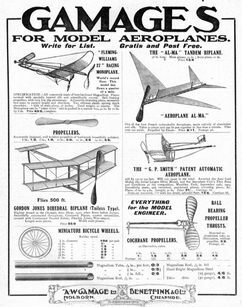 You can purchase much better 8-inch props for rubber band-powered aircraft through most hobby supply centers. 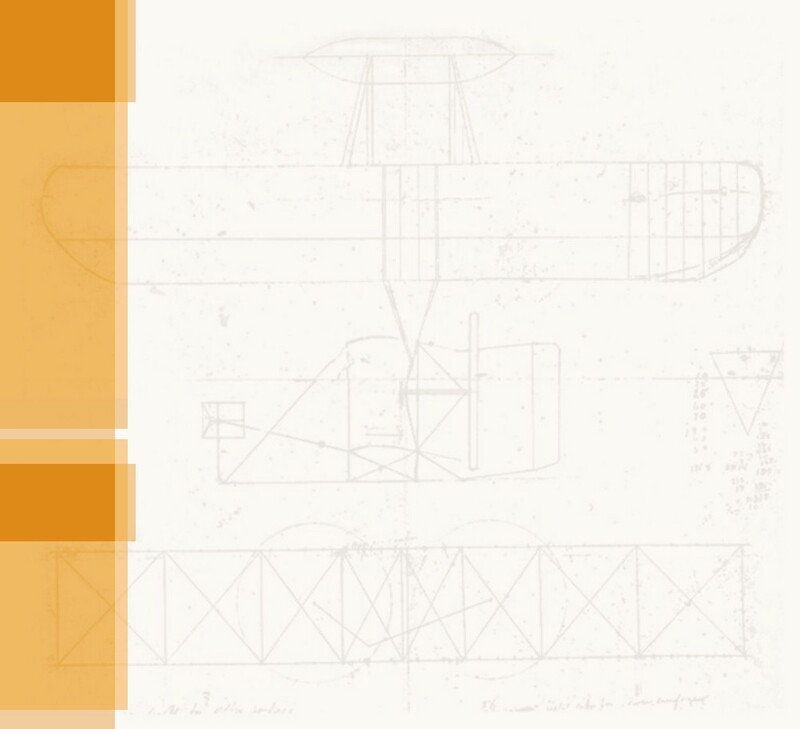 If you choose to make your own, look up a book called Rubber Powered Model Airplanes by Don Ross (Markowski International Publishers, Hummelstown, PA, 1988). Don tells how to design props and shows two simple methods for making them. 5. Steel Wire -- You can by wire prop shafts from most hobby stores. A 3/64" diameter shaft should work well. 6. Bead -- You can also purchase thrust beads and brass washers from hobby stores. Or substitute nylon prop bearings. 7. Music Wire -- Wire is a bit difficult to work with when rigging a model. String is easier, but it increases the amount of drag on the airplane so it doesn't fly as far. A good compromise is to use a monofilament line (fishing line) for rigging. 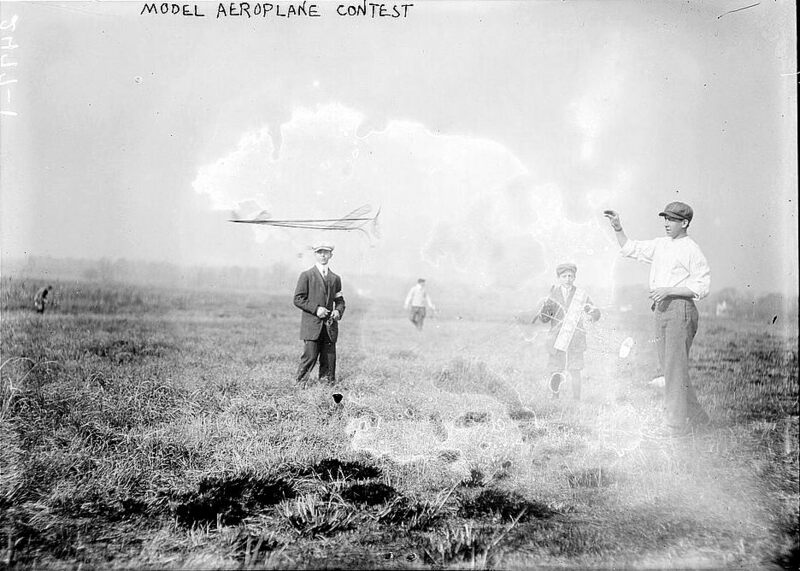 A model airplane contest in 1910. 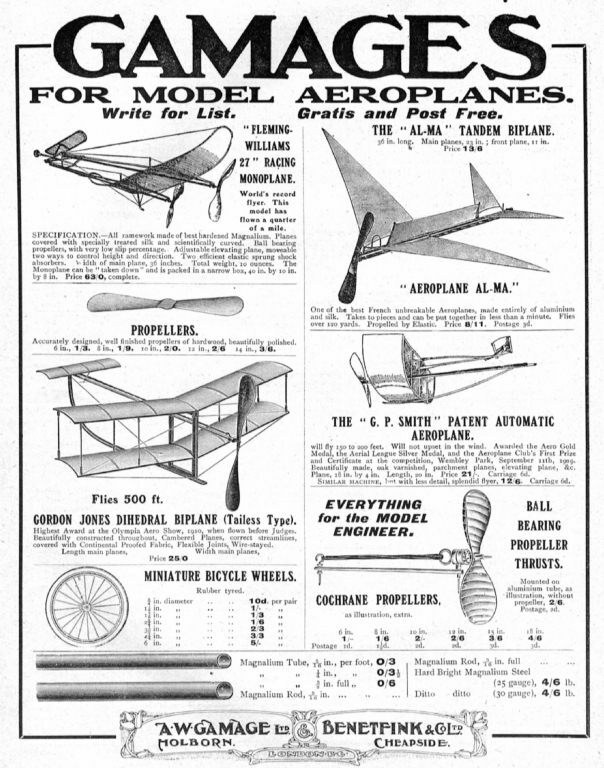 An ad for model airplane kits from 1910. 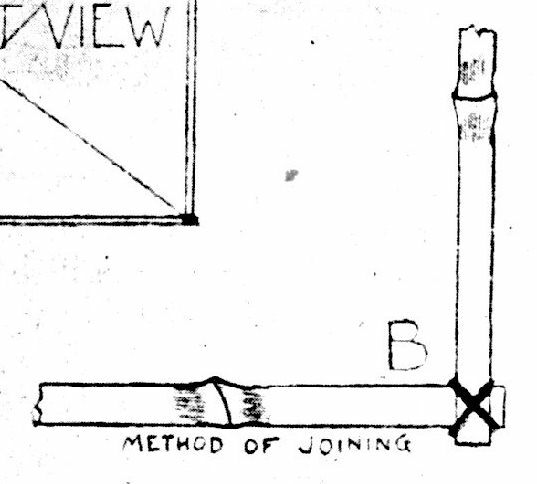 The complete plan, as published in Fly magazine.